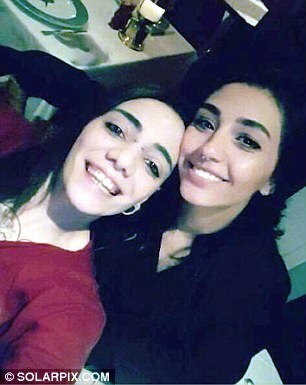 A lesbian couple from London have been found in a Turkish detention centre after trying to flee from a disapproving father who is said to have stolen their passports. Maria Jimena Rico Montero and her Egyptian girlfriend Shaza Ismail had been reported missing after being tricked to flying to Dubai where homosexuality is punishable by death. A friend in the UK then booked them into a hotel in Istanbul but disappeared on their way there having boarded a coach to take them the width of Turkey on Monday. Today, they were arrested for having no passports and were being held by Turkish authorities ahead of their deportation. They are said to be safe and well and a family spokesman said they were unable to call home. Maria, 28, left a desperate WhatsApp message for her family saying Shaza's family had followed her to Georgia with a lawyer and that they had been held for 10 hours at the airport before being released. Her distraught Spanish mum Teresa, revealing the message she sent before vanishing having boarded a coach to Istanbul, said: 'She told me, "If I don't call at midday, it's because something happened to me". Spanish police were in contact with counterparts in Turkey to try to find the pair, who had made no contact with family or friends since Monday morning. Maria, who was born in Argentina, has lived in London for the past four and a half years and her partner is thought to have been based in Britain for around a year and a half. The Spaniard's family say Shaza's dad was hellbent on separating the lesbian pair and forcing his daughter to stay in the Middle East while sending Maria Jimena back to Britain. Speaking to a Spanish TV station earlier today, Maria's 36-year-old said: 'Shaza's dad has told me he doesn't know where they are and hasn't seen them since the incident at the airport in Georgia. 'I don't know whether to believe him or not but I think the fact he's called me means that he really doesn't know anything and is telling me the truth. 'He insists he didn't do anything to my sister. The worried relative said the Shaza's father appeared with security guards and a lawyer in Georgia and took his daughter's rucksack, which contained the couple's passports. 'He wanted to take his daughter with him,' she said. Shaza and Maria were reported missing to the Argentine Embassy in Turkey, who said Spanish police and Turkish officers were looking for them.